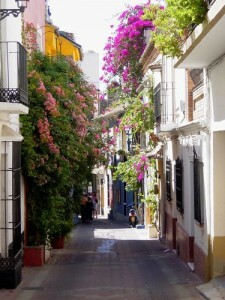 In Marbella spring has also arrived | Marbella Marbella – Adelante! This month I made an excursion to Marbella‘s landmark, the snow-white city gate. Armed with a mini-skirt, hair stylists and make-up artists I scaled the airy heights and tried to keep “my composure” up there – not quite so simple with a light breeze. But as always the never-tiring sun and warmth didn‘t leave me in the lurch. By doing this I‘ve now rung in spring. This summer promises to become particularly fiery. The designer Lhains Obel of the Paris label “Narys 1911” has designed a breathtaking transparent mini-dress for me: with soft colors, painted on fine filmy materials. Ideal for the hot nights in Marbella. The big charity balls are just around the corner. Long evening dresses are the order of the day. For me this means shopping for days on end until I‘ve found the right festive ball gowns. In the luxurious boutiques of Puerto Banus all the designers are prepared for the gala summer season. Of course, I always find the right one there and so too do the discerning ladies arriving from all over the world. At the famous “Marbella Club” on the Golden Mile Prince Hubertus of Hohenlohe has issued an invitation to the opening of an exhibition of his latest works. At the “Houses of Art” gallery he‘s presenting his latest beautiful volume of photographs and his unique large-format photographic art, which bears his unmistakable hallmark. An occasion for me to drop by just before the Concordia Charity Ball. Before the largest annual social event in the Marbella calendar, the “Concordia Charity Ball”, whose president is Princess Marie Louise of Prussia and whose patron is Her Majesty Queen Sofia of Spain, the illustrious guests arrive from all over Europe. Already on the parking lot in front of the Marbella Club the good-humored and expectant guests meet. It was an unforgettable night for everyone with a formal dinner, celebrities, dancing and live bands, raffles and superb speeches in the exquisitely decorated gardens and grounds of the Marbella Club. The proceeds go directly to the Concordia Aids Foundation. During a festive moment at the Concordia Gala I bumped into the well-known Italian artist, composer and writer Dario Poli. Dario told me about his Marbella campaign and his song “Marbella Marbella”, which has become famous and with which he‘s promoting the good image of Marbella and the international jetset scene on the Mediterranean. Spontaneously I was thrilled by Dario‘s constructive commitment and would like to support Dario where I can. As an realtor I know Marbella in great detail and understand Dario‘s deep love for Marbella only too well. All over Spain people are dancing to Dario‘s song “Marbella Marbella” and singing along. A little side trip as a “biker chick” to the cooler Black Forest in Germany was something I‘d earned after so many galas. I enjoyed the winding roads through the fresh green of the old trees and the rapid ride on a “custom-made Harley-Davidson.” The first rays of sunlight accompanied me on this excursion to the Upper Black Forest with its well-preserved mountain villages. This month I‘d also like to present to you a really special and luxurious villa. In the finest district on the Golden Mile lies this villa with 8 bedrooms and a breathtaking view of the sea. On 1.500 m2 no wishes remain unfulfilled with regard to design, styling and the most modern housing technology. This fine property is situated amid traditional landscaped gardens with ponds, fountains and heated pools. Read the full article and see all the photos in the Obtainer magazine.